When we were home on our vacation to Rochester, Dave and I planned to have a date day to spend actually vacationing. We wanted to visit the Finger Lakes, which are about an hour drive away from our home town and just walk around one of the towns, do a little shopping and get some lunch. I started to get a little suspicious when my mom kept asking me if I was excited for date day, and kept asking what our plans were. When we were home, she kept mentioning it, which I thought was cute that she was interested, but I definitely was suspicious that something was up. Dave and I had been shopping for rings, and we were home for the week where both our families live... this would be the perfect time!! So date day ended up being Tuesday, July 29. We drove down to the down of Geneva, because they have a little town with some shops and restaurants, and they have a nice little park where you can walk along Seneca Lake. We drove there, which took about an hour, and Dave decided that he wanted to walk around before we ate, to "build our appetite up." The park was absolutely beautiful. If you ever get a chance to visit the Finger Lakes region, you need to go. There are wineries there, and the weather is amazing. The water is amazingly clear and fresh. It was not too hot that day, and it was a little bit overcast, but it made it very nice to walk along the water. We walked about half a mile down the path, and Dave was super nervous. He was clutching his sweatshirt in his arm in case he got "cold." We were just walking and talking about things, and our visit, and everything was very nice. Then we sat at a bench when he said that he had something to give me, and wanted to ask me a question. He unwrapped a ring box from his sweatshirt, got down on one knee, and simply asked me if I would marry him. No long speech. Nothing extravagant. Just me and my best friend, a beautiful ring and the best question I've ever been asked. Of course I immediately started sobbing (like I'm doing right now while I'm writing this). And said yes. I told him nothing would make me happier than to be his wife. I probably cried for ten more minutes. Right after we went out to eat at a local restaurant called Beef and Brew, and then went antiquing. We kept the news to ourselves for a little while basking in our newly engaged status, and choosing to tell our families in person, rather than making phone calls. How am I just now reading this?! What a sweet story. Thomas only said "will you marry me?" and it was magical. OH and I LOVE LOVE your ring. Is it rose gold? So beautiful. And I'm so happy for you both. Thank you! 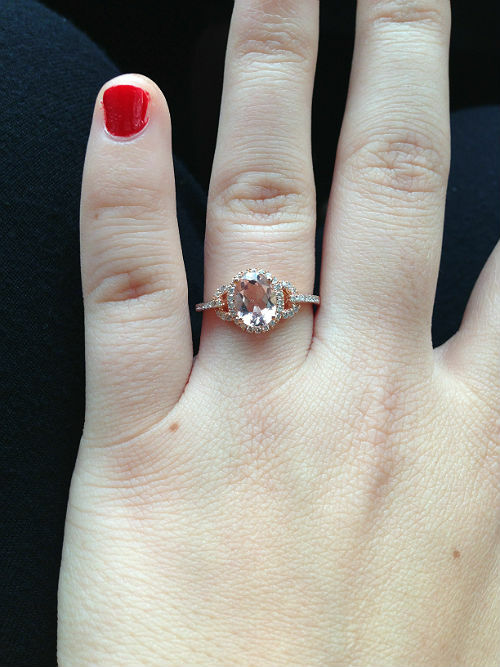 I think the simpleness was what made his proposal so special to me. My best friend would love this. She wants a rose gold ring, I'll have to show her!